Editors: de Lancer Julnes, Patria, Berry, Frances Stokes and Aristigueta, Maria P., et.al. The International Handbook of Practice-Based Performance Management presents the latest scholarship in performance measurement strategies in the field of evaluation. 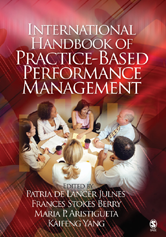 This important resource combines cutting-edge theory and practice of performance management in the United States and abroad. 7. Advancing Performance Measurement and Management for Accountability: King County's Collaborative, Incremental Approach - Cheryle Broom and Edward T. Jennings, Jr.